There are currently 114,994 users on this website. Who's Starting A USA Concave Coin Collection? Fell in love with the Apollo coin. 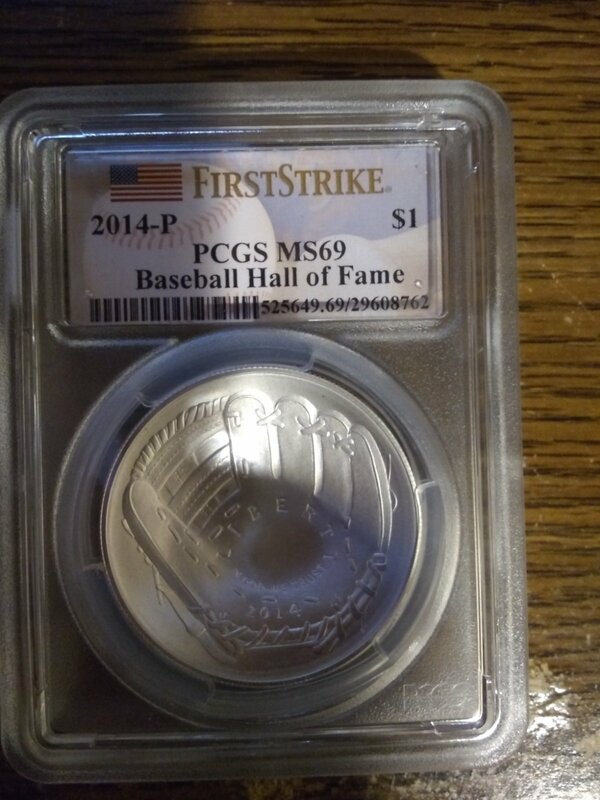 So I bought a Baseball Hall of Fame while I wait for my 1 oz proof and uncirculated Apollos to come back from PCGS. Here it is. Share your pics! I actually plan on buying the Apollo coins and perhaps building a concave coin set. They are extremely pretty in my opinion. I got too many sets to complete before I get myself stuck in concave coins haha, but I'm definitely looking forward to it. I'll wait until they issue a convex coin. You can glue two together. I think Apollo will be the only concave coins I have. I do not see myself going back to get the Baseball coins, but I can see how many will be inspired to do so. I also do not see Apollo as being he last of of the concave coins. I suspect anyone building a US concave set will indeed end up with a rather beefy set of coins. I bought the BHOF proof dollar when it was offered. I also bought a half dollar, but gave it as a gift to a someone who's a major baseball fan. It looks like I've already started a concave US coin subcollection. I've got the 2014 coins and the $5 2019 coin. The 5-oz 2019 is back-ordered. I have a couple junk box Morgans that qualify as concave. I did not plan it, but it seems that I'm on the way. I got all the baseball ones, and most of the Moon ones. I would not have gotten them if they were ugly, but baseball and the quest for the Moon have been two of the things that interested me the most since childhood, so those were coins that I actually bought because of interest in the subject. I'm not much of a commemorative collector otherwise, although I thought the gold Liberty from a few years back was a very elegant coin. But back to your question, it would be interesting to try to think of coins that could be convex without it being a gimmick. I think I saw something about a basketball coin, which makes sense. Maybe the NASA theme could continue with a tribute to some of the flights to the planets, but the rings of Saturn could be a problem. But a coin with the surface of Mars on the convex side and the rover on the concave would be cool, likewise Jupiter on one side and Voyager on the other. how about a shot from voyager 1 looking backwards at our solar system. I know they have one. on the reverse one of the shots of jupiter it took oh it's way out!